It’s the beginning of August, and time for another Granny-Spiration Challenge. I’ve been pressed for time lately, so have not had a chance to be very productive. However, I do have a project that I would like to share…an afghan that I crocheted many moons ago. 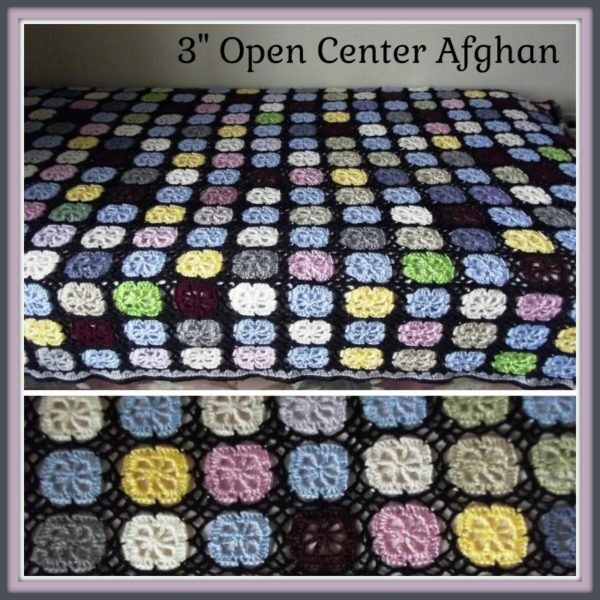 I used my 3″ open center afghan square pattern and joined the squares with the flat braid join. Now, this isn’t exactly a granny square, but you could just as easy make small granny’s and join them with the flat-braid join. The best part is that it makes for an awesome stashbuster pattern. You can use any yarn you have on hand. I used a combination of Caron Simply Soft yarn and Loops and Threads Soft and Shiny. Since I had so many colors and no exact amounts of the squares, I simply scattered them; I tried to do some in a pattern, but it didn’t work out to well. In the end though, it worked out as I had lots of scraps and a new blanket to keep me warm. Anyhow, See Alexandra’s post for this month’s giveaway. It’s a free issue of Happily Hooked, a trendy crochet magazine that comes out each month. So you definitely don’t want a chance to miss out on that. Wow! I LOVE IT! I am so envious of people who can just randomly place squares. I have tried on many occasions to bust through my stash, but I always go back to a set pattern of colors because I just don’t do the random well, but! I absolutely love the look! And with the flat braided join, it makes it lacier and great for warmer weather. I think this design would also look great and be very popular as a rectangle shawl. Thank you! I tried it in a pattern, but had too many random colored squares, so just gave up lol. Wil have to do more planning for my next one.